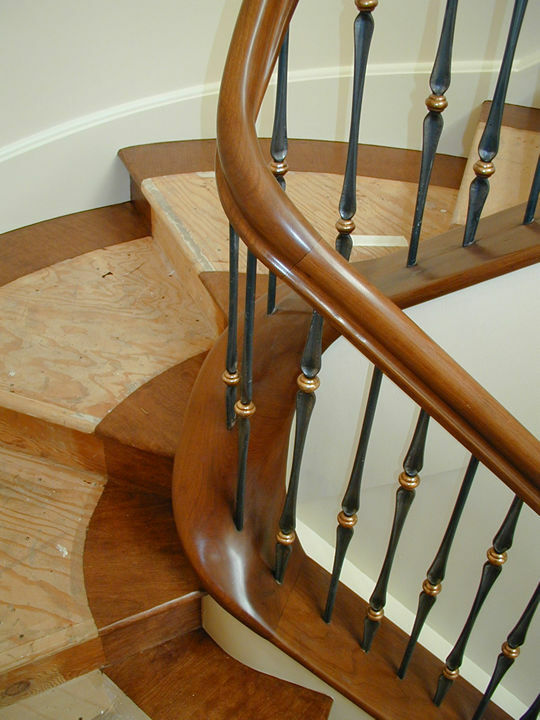 Architectural Stairbuilding and Handrail fabrication and especially curved stairs are often seen as the pinnacle of the carpenter and metalworker trades. By working closely with the architects, designers, builders and homeowners Paradigm can provide project solutions for anything from historic renovation to high-tech modern design. 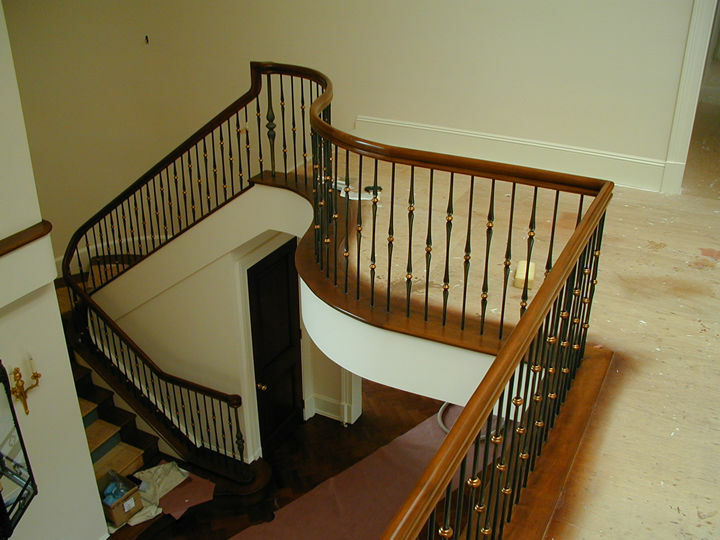 Our artisans can fabricate and install some of the specialty parts and assemblies that many other stair shops shy away from such as helical easings ascending volutes, and wreath turns which gives us the unique capability to provide our clients with smooth flowing continuous balustrade designs. 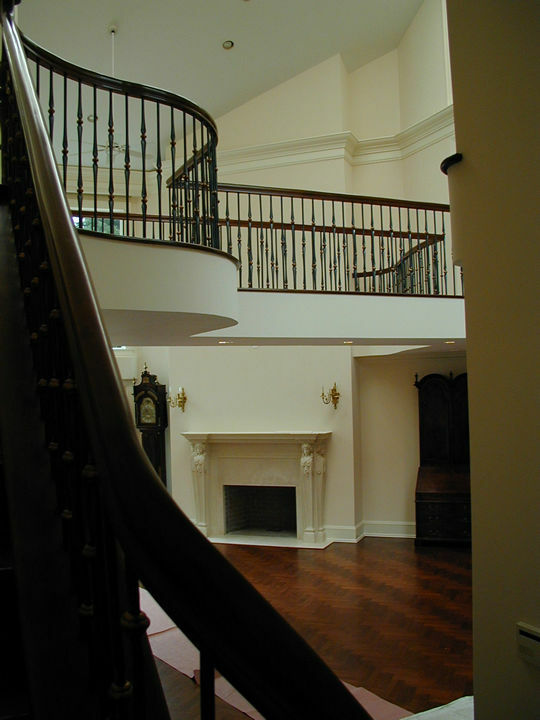 While we do fabricate our railing profiles and parts we can also design and execute stair & railing projects using stock parts from any of the national stair companies so our projects can be tailored to fit a wide range of budgets. Since “the process”, how we work, is so important to us here Stairscapes@Work is a gallery of not just of pretty photos of finished projects but perhaps even more importantly the in process photos of just how we got there to achieve the final result. I just wonder how you even get the opportunity to do projects like these. Matt Risinger, a builder down south, with a elegant solution to bring a beautiful old railing that doesn’t meet today’s safety codes up-to-date. From PitcairnFranklin Ltd Craftsmen in Wood, a small bespoke business based in Bedfordshire,UK. (FaceBook | Website). If you’re interested in something like this for you home in Westchester NY or western or central Connecticut give Jerrald Hayes a call at 860-470-7686 and we’ll talk about how we can possibly put together a project plan for you. An interesting project we/I would probably like to fabricate one day. A good look at one stairbuilders (Jed Dixon’s) methods and workflow for detailing and trimming out a stair. Via my remodeling friend and colleague Philip Herzegovitch of Daedalus Design LLC. (DaedalusDesign.net) and on Houzz) of Danbury CT.